Velvet is a luxurious fabric used in both apparel and décor. Since velvet was a complicated and expensive fabric to make before industrial looms, it’s associated with royalty and luxury. Velvet that is used for apparel is lightweight, soft, and plush with a lustrous sheen and nice drape. Apparel velvets include: micro velvet, stretch velvet, crushed stretch velvet, and panne velvet. Upholstery velvets are thicker and have a stiff backing, so they won’t drape as well. They aren’t as shiny as many apparel velvets, but they have a nice luster and feel. Micro velvet is a durable fabric made from very fine polyester. The Fairvel micro velvet is silky soft with a beautiful drape, making it great for curtains as well as apparel. It’s crush resistant and lustrous without being shiny. It doesn’t stretch. Stretch velvet is made with spandex to make it stretchy. It can stretch up to 25% in any direction, so it’s good for clothing and costumes. It’s shinier than the micro velvet. Crushed stretch velvet is also stretchy and it’s crushed so the nap is facing in different directions, creating an irregular pattern. Panne velvet is also a crushed velvet, but the pile is flattened just in one direction, so it looks different from the crushed stretch velvet. Unlike all the others, this panne velvet has a knit back instead of woven, so it is also stretchy, but just side to side, not up and down. It’s also a lighter weight than the rest. Velveteen is similar to velvet, but has a shorter pile, doesn’t drape as easily and has less sheen. It’s often made of cotton. JB Martin makes several beautiful upholstery velvets. The Como and Cannes are cotton velvets. They aren’t as shiny as many of the apparel velvets, but have a nice luster and feel. The Cannes velvet has subtle horizontal striations giving it a different look. JB martin also makes luxurious mohair upholstery velvet. Bella velvet is a micro velvet made out of polyester. It has a very soft feel and isn’t too shiny. 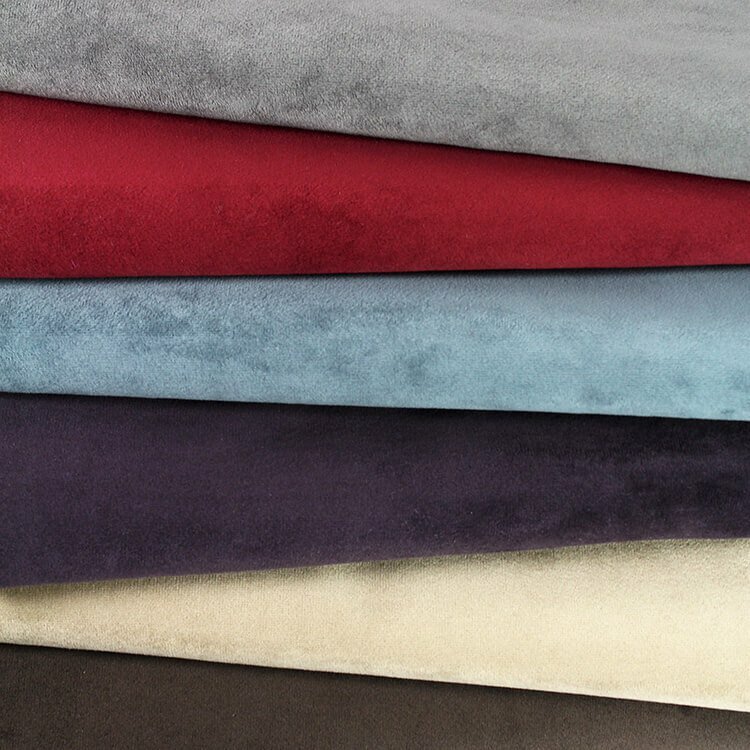 Crypton fabric is known for its durability and stain resistant finish and Crypton Home Velvet is no different. This is the most durable option for upholstery velvet. You can also get crushed flocked upholstery velvet. Chenille looks and feels very similar to velvet, but is made using a different process. Velvet has a smooth and even surface, while chenille’s texture is generally more nubby. But both are great upholstery fabrics. See our great selection of velvet fabric here. What to line panne velvet with? BEST ANSWER: It depends on what you're making, but habutai or broadcloth would likely work depending on if you want something with shine or something matte. can I use micro velvet instead of cotton velvet for a Scottish Dance vest? BEST ANSWER: Yes, micro velvet would work. We recommend ordering a sample to be sure that it will work for your project. what kind of velvet would you use to cover a display case? BEST ANSWER: It depends on the look you're going for. Crushed velvet is commonly used, velveteen may also look nice. We recommend ordering samples to compare them before committing to one. BEST ANSWER: Mohair fabric is made from the silky hair of the angora goat. Which velvet would attract the LEAST dust and lint? BEST ANSWER: Cotton is less prone to static than polyester, so the JB Martin Cotton Upholstery Velvet and velveteen (though not a true velvet) will attract the least dust and lint. The rest are made out of polyester.